rob mclennan's blog: What kind of city would you like to live in? What kind of city would you like to live in? After seeing Amanda Earl’s post on same yesterday, I have decided to respond to city editorial editor Ken Gray’s piece in The Ottawa Citizen yesterday (“What Kind of Ottawa Do You Want?” p F4, Friday, December 19). For years, I’ve been an advocate of Ottawa’s self-respect as both a world-class city and a city made out of locals, even to the point of producing a book on some of what we have to offer, both currently and historically—Ottawa: The Unknown City. What kind of city would I like to live in? I would like to live in a city where we have a mayor who doesn’t create divisions; it is a poor system we live in when city councillors that have been around for years, not necessarily agreeing to many of the same things, have to band together to pass a city budget against the wishes of the mayor. It is a poor system when that same mayor ends up making public comments responding to the city’s finances and OC Transpo that give us, within days, a major transit strike, hitting retailers, university students writing exams, and others exactly where they hurt most. I would like to live in a city that doesn’t suffer the kind of lack of vision that would arbitrarily cut cultural funding, saving short-term money against every financial argument against, let alone any cultural arguments. I would like to live in a city that doesn’t attempt to re-gift Queen Elizabeth II’s Royal swans, or talk of closing hospitals, reducing police services, and cutting community hockey rinks. Why does no-one in the suburbs realize that to cut after-school programs leads, far too often, to needing more police in those same areas down the road? Since Gray mentioned same in his article, I would certainly give credit to a space such as Scotiabank Place, and the return of the Ottawa Senators in the early 1990s as something that has given the city a sense of pride, hope and financial return. It was a great thing for Mayor Larry O’Brien to open up Elgin Street during the Senator’s time in the Stanley Cup playoffs (one of the first Stanley Cup games was played in Ottawa, where a laundromat now stands at Gladstone and Percy Streets). More of this kind of local pride needs to happen. I am glad O’Brien enjoys hockey and supports it, but the nation’s capital is a city made up of far more than the NHL. The function of a Mayor is to work for the sake of the people within the city, and not simply for the sake of his own personal interest (it didn’t help that our same mayor was photographed last week embracing the Stanley Cup as it travelled through town). As Gray writes, we need to be participants in our city, and not merely self-absorbed observers. Since I returned to the city of my birth in 1989, I have seen the downtown core lose banks, stores, movie theatres and many other services. I shouldn’t have to travel from Centretown to South Keys or Gloucester Centre to see a film. My Royal Bank branch at Bank and Somerset Streets no longer exists, replaced by a cash machine, unprotected by the elements in what is one of the coldest world capitals. Every half decade or so, I’ve seen attempts to revitalize stretches of Bank Street, the Sparks Street Mall and Rideau Street, little of which has managed to stick. I’ve seen heritage buildings torn down, fall down in disrepair and otherwise threatened, and seen much of the city’s population, whether artists, high tech employees or others, feeling forced out, and have to finally leave for greener pastures. 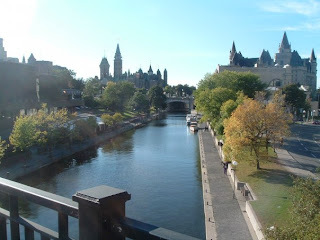 I want to live in an Ottawa that has respect for itself, that doesn’t dump on our next versions of Alanis or Tom Green for staying, dump on them for finally leaving, and then fall all over itself in praising them once they start getting the acknowledgement, respect and support they deserved all along by someone outside the city’s boundaries. I want an Ottawa that stops acting like Canada in the 1960s, refusing to see what anyone has accomplished until some external acknowledgment happens that we can then latch ourselves on to. I want an Ottawa that is confident about its own mind, and its own choices. I want a city that grants self-respect and self-awareness for what we already are, through funding, media (much of which I see currently lacking, and who often seem blinkered and dismissive) and population. I would like to see a books section of The Ottawa Citizen that stops pretending to be a national paper and treats local authors with respect. Local weeklies in cities such as Montreal and Edmonton are far more aware of promoting and discussing their writers than our local daily in the national capital (not to mention other media, with CBC Radio being a notable exception). Lester B. (“Uncle Mike”) Pearson knew the importance of needing a national theatre in Ottawa, and, despite years of unnecessary battles against the idea, he was finally able to give us the National Arts Centre in 1967, on the same site of the former Russell Theatre, burnt in the 1920s, and, against the wishes of the population by a small-minded city government, wasn’t rebuilt, but paved over for the War Memorial. I want a city of Ottawa with vision, one that could have turned the old Duke of Somerset and surrounding building into a version of Toronto’s Drake Hotel at Bank and Somerset. 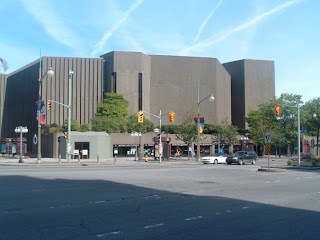 If hotel space in Ottawa is at such a premium, and conference space is booked a year or so in advance, why not an Ottawa hotel combining inexpensive and not-inexpensive with a martini bar on the main level and cultural space for readings, musical performances and theatre, in the basement. It would take time, but it would return any investment, and add vigor to an important corner of Centretown. I find it interesting that, in Gray’s editorial, he cites the 1950s as one of the last impressive periods of Ottawa’s development. Originally, it was Prime Minister William Lyon Mackenzie King who had commissioned city planner Jacques Gréber in the 1940s to create Ottawa’s first official “city plan,” thus creating what became the horseshoe of deliberate greenspace around what was then the City of Ottawa. Is this what Gray talks about? Hindsight is always a funny thing, and those who were involved in the city at the time weren’t terribly impressed with the idea, and even developers at the time railed on against perfectly good land not allowed for their own projects, giving Gréber the nickname Jacques Grabber. Certainly Gréber was an innovator who changed the face of the city, removing rail from the city’s downtown core, creating the Queensway and other traffic-reducing problems, but he wasn’t hailed as being any kind of problem solver at the time. I will simply presume that Gray’s 1950s dream didn’t include LeBreton Flats, originally a thriving neighbourhood torn down for a development that never quite happened. I want to live in a city that at least sees the second half of any plan where the first half involves tearing stuff down. Why don’t we have more of those? Remember the Daly Building, and how long that space was empty? Vision comes at a cost, and the cost involves not everyone understanding the benefits until sometimes much later. True vision involves risk, and character, and I want to live in a City of Ottawa where that vision exists, because any true vision hasn’t existed here in quite a long time. Thank you for telling me of the Russell Theatre.